NPR has been doing stories on high speed rail this week; the stimulus bill includes about 8 billion for HSR initiatives. The California project would zip through Redwood City, and we might be one of the Bay Area stops for the SF to LA line, so this topic interests the Mellowcat. The stories so far have highlighted the fact that “high speed” is only about 80 mph for most of these projects, which is slower than the average speed of passenger rail in the early 20th century. The NPR guys seem confounded and incredulous when this is mentioned. 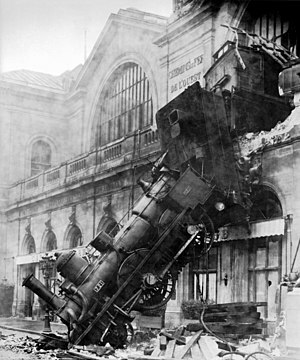 But they fail to recall that the early 20th century was also the heyday for the genre of train wreck songs. Possible connection? Who can say. They found him in the wreck, with his hand on the throttle.